Some energy drink manufacturers[who?] do not report how much caffeine their products contain. One survey found that various energy drinks had 6–242 milligrams (mg) of caffeine per serving. In comparison, an 8 US fluid ounces (240 ml) cup of coffee contains 100 mg of caffeine and 12 US fluid ounces (350 ml) of Coca-Cola Classic contains 35 mg of caffeine. 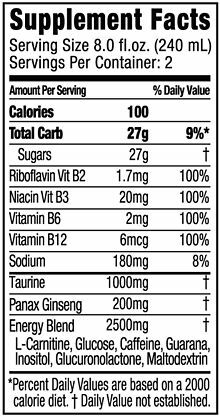 Consumer Reports expected that the caffeine content of a drink should be within 20% of what the label claims, but product testing on United States energy drinks found that the caffeine levels of some energy drinks vary beyond that range. The Monster Beverage Corporation explained they do not report caffeine levels because "there is no legal or commercial business requirement to do so, and also because our products are completely safe, and the actual numbers are not meaningful to most consumers." Scientific groups and consumer organizations have requested more disclosure in ingredient lists. Globally, energy drinks are typically attractive to young people. Approximately 66 percent of consumers are between the ages of 13 and 35 years, with males being approximately 65 percent of the market. 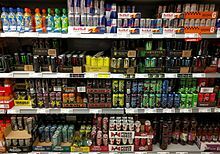 A 2008 statewide Patient Poll conducted by the Pennsylvania Medical Society's Institute for Good Medicine found that: 20 percent of respondents aged between 21 and 30 had used energy drinks in high school or college to stay awake longer to study, or to write a paper; and 70 percent of respondents knew someone who had used an energy drink to stay awake longer to study or work. ^ Visram, Shelina; Crossley, Stephen J.; Cheetham, Mandy; Lake, Amelia (May 31, 2016). "Children and young people's perceptions of energy drinks: A qualitative study". PLoS ONE. 12 (11): e0188668. doi:10.1371/journal.pone.0188668. PMC 5708842. PMID 29190753. Bagchi, D. (2017). "Chapter 26: Caffeine-Containing Energy Drinks/Shots: Safety, Efficacy and Controversy". Sustained Energy for Enhanced Human Functions and Activity. Elsevier Science. pp. 423–445. ISBN 978-0-12-809332-0. Retrieved October 23, 2018.